MEXICO CITY (Sputnik) – Brazilian presidential candidate Jair Bolsonaro, the front-runner in the upcoming election, who was recently stabbed at a campaign rally, said he would not be able to participate in TV debates before the first round of the vote due to his condition. "I carefully follow the recommendations of the medics. I am unable to participate in the debates before the first round [of the election]. But I will participate [in the campaign] online," Bolsonaro said in an interview with the Folha de Sao Paulo news outlet, released on Friday. 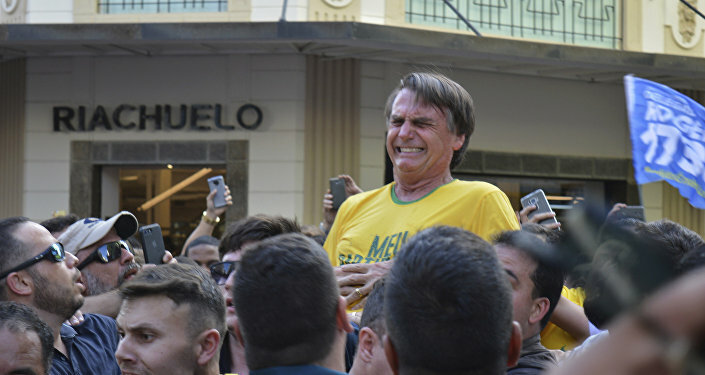 Bolsonaro sustained a liver injury in a knife attack during the campaign rally on September 6. The presidential election will be held in Brazil alongside the parliamentary vote. The first round of the presidential election is scheduled for October 7. The second round is set to be held on October 28 if the 50-percent threshold would not be met by any candidate. According to fresh poll data, 28 percent of the voters are ready to support Bolsonaro at the upcoming election. His rivals Fernando Haddad and Ciro Gomes are projected to receive 16 and 13 percent of the ballots, respectively.